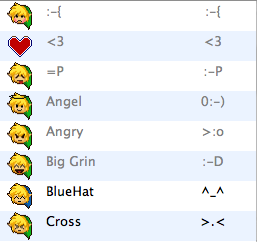 Now who doesn't love Link emoticons? A port from the GAIM pack by Obsequious Eye, based off the Zelda Legends Forum. 0.3: Implemented doubleback's lessthanthree icon. Much better. Thank You! These are fantastic. Thanks for porting them. N.B. : This set is larger (in pixel height & width) than most standard emoticon sets. I don't personally think that's a negative, but it might be for others. "This set is larger (in pixel height & width) than most standard emoticon sets. I don't personally think that's a negative, but it might be for others." What size were you thinking of? They're currently 25x29, and I've found that even 20x23 you lose details. Also, some of them have small motion that was not included in this version; how many of you would you be interested in moving emoticons? (Ex. Eyes move in 'Shifty', hand moves in 'Unsure') It's either motion or smaller, though, the motions are all blurry at 20x23, and I'm assuming you want something like 16x18. From a clarity standpoint, it doesn't make sense to make them any smaller, and I know some people find motion irritating. :-/ The vote is on! I set incoming and outgoing fonts to ten point and most emoticons scew up the line spacing. I could see how shrinking in would mess it up. I was just thinking alound. One of the hearts for the life meter would make a excellent "kiss" icon though. @mirror_ofthe_moon: If you do decide to shrink them down (I don't think you should), please leave this set as-is and create a separate smaller set. These emoticons are optimally designed down to the pixel, and I'd hate to see the artistry compromised. I just installed the latest version of this, and now every time I try to open the Appearance Prefs in 1.0b7, it crashes Adium. It has to be this xtra, because when I remove it, there's no problem. Anyone else getting this? I'm getting this, too, funny enough. I have NO idea how/why it happens.... I'll put it in the "changes", though, to save everyone else... If anyone has any idea tell me! Now that I've seen it, I'm disabling it instead. There's no :O face. JUST SAYIN.